I am so lucky I didn’t throw this 45 in the “I’ll go through these 45’s later” bin. Usually when I see the word Mariachi, ill toss the 45 straight into that abyss I have created in my basement. 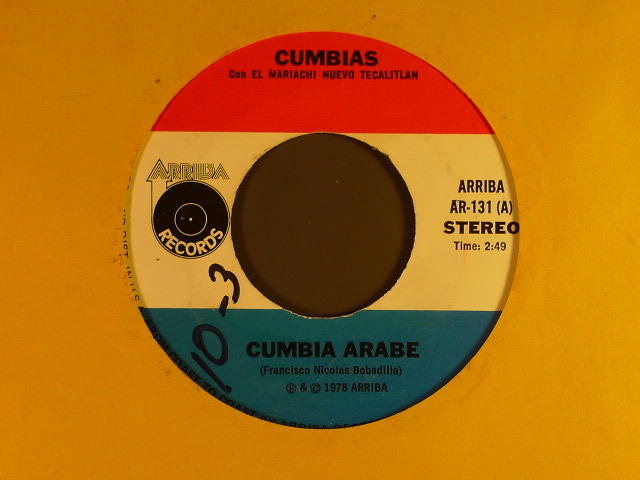 But fortunately I saw the words Cumbia + Arabe (Arab) on it, a song which I am very familiar with. Thanks to everyone who liked my earlier Afrosound post. It got a lot of attention and it’s one of the reasons why I am posting this 45. This song was originally written by them (Francisco Bobadillo/Afrosound) and despite being a bit more heavy on the Mariachi orchestration, this cover tune is almost exactly like it’s original. Tecalitlán is located in the central state of Jalisco and it is pretty much the birth place of Mariachi music. Mariachi Vargas de Tecalitlán created the sound in 1897 and after 5 generations, they still perform today. This is a really great link to see how popular South American music is/was in Mexico and how cumbia was gaining ground with regional styles at the time. Trying to do a Los Destellos post this Sunday. Please cross your fingers.